Airline travelers are used to being instructed to turn off computers and cell phones during takeoffs and landings as a precaution against interfering with the plane’s navigational equipment, but outside sources of high-energy interference can be even more dangerous. 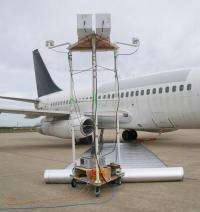 Recent tests by researchers at the National Institute of Standards and Technology will provide much needed, independent data on how electromagnetic radiation penetrates aircraft, helping to ensure continued air travel safety. The Federal Aviation Administration (FAA) requires aircraft manufacturers to demonstrate that their aircraft have effective high intensity radiated field (HIRF) protection. The manufacturers conduct tests on their aircraft and provide those results to the FAA as part of the certification process. The tests are designed to show where and to what extent electromagnetic radiation, across a wide spectrum of frequencies, penetrates a given craft’s airframe. This information is important in determining if and where shielding is needed to protect vital electronic instrumentation from malfunction or damage while flying through ground-based radar beams, for example. This effort was undertaken to assist the FAA with HIRF measurement procedures and data processing methodologies. The FAA has struggled with data sets provided by HIRF testers because they use a wide range of measurement/data processing techniques that are not standardized. The three aircraft chosen for the representative tests were a Boeing 737-200 and a Bombardier Global 5000 business jet, both owned by the FAA, and a Beechcraft Premier IA carbon-fiber composite business jet, owned by the Hawker-Beechcraft company. By measuring all three aircraft and comparing the results, NIST was able to provide a guide for the optimization of HIRF testing standards for the EMC aircraft manufacturing community. The tests were conducted over a two-year period using a commercial measurement system that incorporates NIST-developed ultra-wideband antennas, a network analyzer and an optical fiber link to obtain high-resolution measurements from the megahertz to gigahertz range. NIST-developed special software extends the number of frequencies to any desired value using a variable number of bands. More information: C. Grosvenor, D. Camell, G. Koepke, D. Novotny and R.T. Johnk. Electromagnetic airframe penetration measurements. Paper presented at the 2009 IEEE International Symposium on Electromagnetic Compatibility, Austin, Texas, Aug. 17-21, 2009.